In a poll for Claire Byrne Live, 73% said they’d like to see an All-Ireland soccer team similar to rugby. NEARLY THREE IN four of us would like to see a merger between the Republic of Ireland and the Northern Ireland soccer teams, according to a survey for RTÉ’s Claire Byrne Live. Amarách Research asked 1,000 Irish adults what they thought, and 73% said they would support an All-Ireland international team. Just under one in five (18%) said they didn’t want the teams to unite, while 9% said they don’t know. Northern Ireland lost their World Cup playoff tie 1-0 to Switzerland last night, while the Republic of Ireland face a nail-biting second leg against Denmark in Dublin tomorrow after the first leg finished 0-0. Since partition in the 1920s, there have been two separate international soccer teams on the island of Ireland. As it stands, players born in Northern Ireland can opt to represent the Republic of Ireland at international level. Current players born in Derry, for example, include James McClean and Shane Duffy. In rugby, however, the Irish team comprises players from all four provinces. 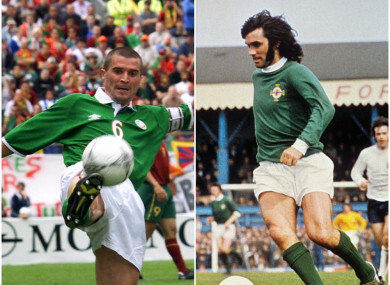 Having a similar system to rugby would have seen Ireland field teams that included the likes of George Best, John Giles, Liam Brady and Pat Jennings at the same time in the past. Northern Ireland will not be going to next year’s World Cup, having lost the tie in controversial circumstances with a disputed decision not dissimilar to the infamous Thierry Henry handball which cost the Republic of Ireland a chance to qualify for the 2010 World Cup. The Republic are still in with a shout this time, however, with a packed Aviva Stadium set to cheer on the boys in green tomorrow evening. Email “Nearly 3 in 4 of us would like to see an All-Ireland soccer team”. Feedback on “Nearly 3 in 4 of us would like to see an All-Ireland soccer team”.